With the calendar approaching April the halfway point of the college baseball regular season is upon us. By now most D-II and NAIA teams have at least 25 games under their belt, although their D-III brethren are a bit behind due to later starts and weather. As such a relatively safe statement can be made as to which teams are legitimate title contenders, who still has something to prove and which clubs need to pump the brakes on championship aspirations and just enjoy the ride. Accordingly, players from each of the three small school divisions have had ample opportunity to show what they’ve got as well. There are a number of players having sensational first halves of the season, and while a couple dozen games don’t make someone an All American, early numbers can be a strong indicator of who would be receiving accolades and shiny plaques at season’s end. Along with the latest updates for each of the three divisions midseason awards for Most Valuable Player, Most Outstanding Player and Most Outstanding Pitcher have been declared. Calling each of the races was a difficult task, especially for D-III as there are wealth of clubs who haven’t even played a dozen games yet. Nonetheless, the selections have been made and appear below. Rankings are based on games through Sunday, March 24. Last season UNG finished 31-22, a respectable record, but a far cry from the quarterfinals for the D-II Championships they reached the season before. This season they are among the national elite once again thanks in large part to their senior second baseman, Chase Sudduth. Sudduth has started every game for the now fifth-ranked Nighthawks and is topping the team in batting at .367. He also leads the club with 27 runs, 10 doubles and 73 total bases. He’s also added a pair of triples and five home runs to amass a robust .608 slugging percentage, which places him sixth in the explosive Peach Belt Conference. In addition to his offensive prowess he is dynamite in the infield, holding down second base with only three errors in 124 chances for a stellar .976 winning percentage. Sudduth hasn’t been padding his stats against cupcakes either. He’s put together some of his best games of the year against the staunchest of opposition. Against Southern Indiana, USC Aiken and West Florida, Chase batted .485 (17-for-35). Also considered: Erik Webb, Central Missouri; Cade Spurlin, Dixie State; JT Stone, Mount Olive. John Michael Faile is the top player on the top team and has helped keep the Crusaders in either the first or second ranking position all season. His offensive production has been absolutely off-the-charts and near unpreceded for a freshman. As the club’s catcher he is leading the team in batting at .440 and has mashed 11 home runs and ripped seven doubles to compile 84 total bases and an .840 slugging percentage that is in the top 10 in the country. Faile was named the NCBWA Division II Player of the Week to start the season when he collected six hits, which included three home runs, and drove in 13 against a highly competitive Nova Southeastern team. Also considered: Josh Elvir, Angelo State; Tyler Thompson, Carson-Newman; Marquise Lanier, Chowan. Hutson is a pitching vagabond, having previously pitched at D-I Abilene Christian and junior colleges San Jacinto and Crowley County. He has settled into his role in Grand Junction with amazing ease and quickly has become one of, if not the premier pitcher in all of D-II baseball. In seven appearances so far this season Hutson has earned the win in four and a save in another. He stunningly has gone the distance in four of his five starts on the mound, two of which were shutouts. In total he has thrown 37 1/3 innings and only allowed 22 hits (.164 opposing batting average) and only walked four batters with 42 strikeouts. Also considered: Charles Hall, Tusculum; Will Bausinger, Missouri Southern State; Joe Corbett, West Texas A&M. Dropped out: UNC Pembroke (23), Bloomsburg (25). Pope put up better-than-average numbers last season, hitting .335 with six home runs. However, this spring he has emerged to wield one of NAIA’s most dangerous bats, clubbing his way to a .451 batting average with seven doubles, four triples and five home runs. Those bountiful numbers put him in the top 25 nationally in slugging percentage. He also is 20th in the NAIA in RBI with 36. Unquestionably if you remove Pope from the heart of the Tabor lineup the club transforms from a very good team (up to 21st in the latest rankings) to one merely on the outskirts. Only one everyday Bluejay teammate is even within a hundred points of his batting average. The team is batting a collective .312, but if you take out Pope’s numbers that mark drops all the way down to .293 – a difference of 20 points. Not surprisingly, Tabor head coach Mark Standiford had nothing but praise when asked about Pope’s performance this spring. Also considered: Austin Sojka, Oklahoma Wesleyan; Garrett Hall, Keiser; Luke Burris, Bryan. No player is putting up more obscene numbers this season at the plate than Oklahoma Wesleyan’s Austin Sojka. In 28 starts he hsa tallied 101 at-bats and performed cheer-inducing reactions with nearly each swing. He has 55 hits to compile a .545 batting average, 12 home runs and 11 doubles. His slugging percentage is an eye-popping 1.030, which puts him second in the nation. As if those numbers weren’t enough to drop your jaw to floor, also consider that he has only struck out nine times while walking 20, and being hit by a pitch on seven occasions. Those number combine to give him a .641 on-base percentage on the year. Coach Kirk Kelley says that video-game number put up by Sojka are legit. Also considered: Anthony Lepre, The Master’s; Willie Carter, Webber International; Raudy Martinez, Cumberlands. Even Gillespie has started seven games for the Eagles this season and has earned the win in each of them. Even more impressive is the quality of opposition he has faced to earn those victories – he held Freed-Hardeman and Georgetown scoreless and kept a stalwart and surging Middle Georgia State at bay this past weekend. Additionally he only allowed two hits in over nine combined innings against quality clubs Wiley and Blue Mountain. Statistically he has been a freak. He has only allowed four earned runs over his 37 2/3 innings for a 0.96 ERA. Only 27 hits have been collected against him for a tiny .194 batting average. Meanwhile he has struck out 49 batters. It’s an amazing turnaround for a player who had a husky 5.21 ERA in 38 innings just a year ago. Also considered: Colton Williams, Science and Arts; Bryce Milligan, Oklahoma City; Peyton Long, Central Methodist; Parker Robinson, Texas Wesleyan; Victor Del Carmen, Southwestern Christian. Fontbonne has not had a winning season since 2014 but that is most certainly going to change this season. The Griffins are currently 14-3 and have entered the Perfect Game Top 25 rankings for the first time in school history following their split with Spaulding. A big reason for their turnaround this season is the on-the-field exploits of junior utility player Luke Summers. As a pitcher Summers has had few rivals statistically. He has started six games and earned the win in five of them, two of which were complete games. He has compiled 43 innings on the mound and only allowed 23 hits. His season ERA is 0.63 and he has struck out 63 batters to the tune of 13.19 per nine innings. Summers has also helped the team with the bat. As an occasional outfielder he has 14 at-bats and rapped out seven hits and scored five times. Also considered: Tanner Wright, Cal Lutheran; Nick Herzog, UMass Boston; Brady Ballstadt, Piedmont; Bryce Brueggemeyer, LeTourneau. Ballstadt earned the USA South Player of the Year honors in 2018 as he led the Lions in runs, hits, doubles, triples, RBI and stolen bases. This season he is well on pace to eclipse most, if not all, of last year’s numbers while also leading his team into the conversation of the nation’s elite. In 26 games this season he is currently batting .421 with 18 extra-base hits and 15 stolen bases. In the series finale against Berea College last weekend he went 4-for-4 and was a home run shy of hitting for the cycle. 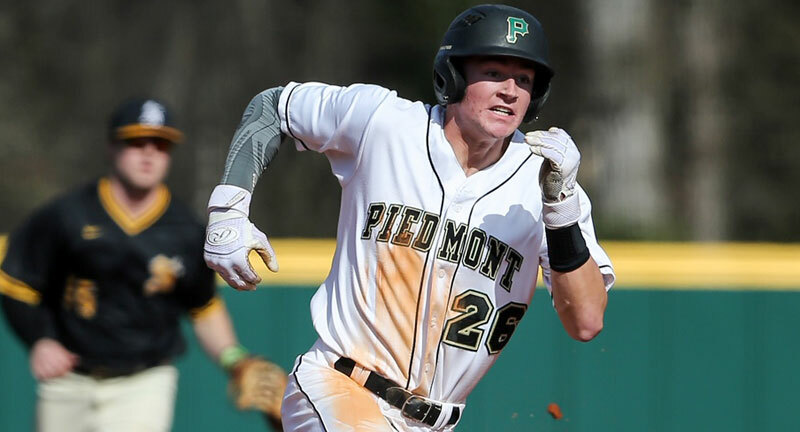 With those numbers he had powered Piedmont to a 20-6 record and the 21st position in the latest Perfect Game rankings, the first time the Lions have been listed in the PG Top 25. Also considered: Tanner Wright, Cal Lutheran; Luke Summers, Fontbonne; Rafe Chaumette, Trinity. Misischia has always been a dominant hurler for the Panthers, striking out well over a batter per inning in both his sophomore and junior seasons with 10.5 and 11.9, respectively. To close out his college career he is throwing in another echelon, continuing to blow away batters while helping lead BSC back to national relevancy. In 11 appearances this spring he has thrown primarily out of the bullpen. In those outing he has compiled a 6-1 record with three saves. His total innings thrown has grown to 27 while only allowing 14 hits. Meanwhile he has struck out 36 batters and has accrued a 1.67 ERA. If he continues him dominance it is only a matter of time before the Panthers re-emerge from their ranking hiatus. Also considered: Nick Garcia, Chapman; Luke Summers, Fontbonne; Jack Bunting, Johns Hopkins. Dropped out: St. John Fisher (15), Oswego State (16), Concordia (18), Cortland State (21).